White, male with 12 short, thick stamens; female, less showy with hairy carpels in centre. Conical tree with spreading, rather drooping branches. A rainforest tree found also in the understorey of some tall eucalypt forests. 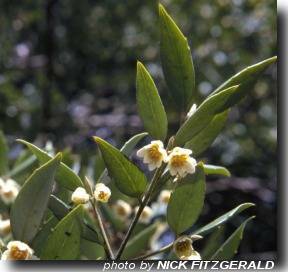 Occurs from sea level to the alpine zone where it is an infrequent shrub. Also occupies gullies in drier areas in the east. Seed should be sown very soon after collection or after several months storage.